In store-bought clothes, you’d usually see that the waistbands of pull-on pants or skirts are topstitched. At home, I try to achieve that same look too. But it’s not just a matter of esthetic; by topstitching the waistband, the elastic inside does not roll or move anymore, so you will never have to fuss with it. There is really nothing much about stitching on the elastic, but there are several things you need to pay attention to. Let’s get started on a waistband with the elastic already inserted. Be sure that your the waistband fabric is somewhat evenly distributed on the elastic. And of course, try on the pants and make sure that the waistband fits you. 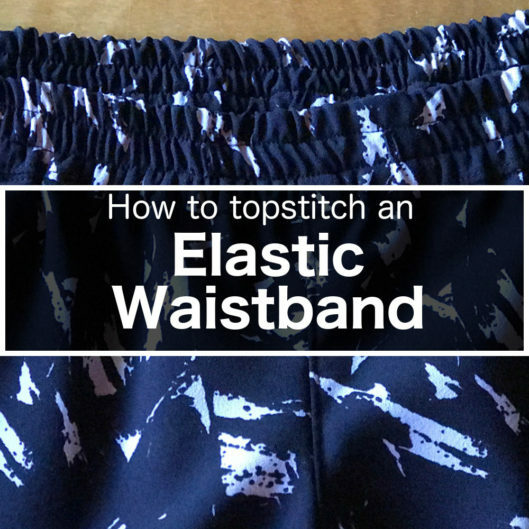 You might need to make the elastic slightly tighter if your elastic’s quality is not superb, because by stretching and stitching on the elastic, it is lightly to be stretched out. At the sewing machine, sink your needle into where you want the stitch line. I usually start in the back of the waistband, but it really doesn’t matter much. I usually use a 3.0 mm stitch length. Now this is the most important point – you need to stretch the elastic while stitching. Go ahead and stretch it fully with both of your hands – one in the front and one in the back. You don’t want to give any stress to the needle, presser foot or the feed dog. At the same time, you need to let the feed dog do its work to feed the fabric as usual. Photos really don’t do the job very well, so here’s a short video of what I do. Usually there are at least 2 or 3 lines of stitching around the waist. So after you finish one round, start another round until you are all done. Then give it a good stream and that’s all! Ready to try the technique? Try it on the Tierras Woven Joggers or the Belize Shorts & Skort! Is there an easier way to expand an elastic pant waist that has been sewn 4 lines within the waist? Or do I need to remove the 4 stitched lines and add an extra inch to the elastic, before sewing the elastic back on the pants? Thanks! What brand of elastic do you use? I buy my elastic locally here in Costa Rica. Sorry, there’s no brand name (but you probably wouldn’t be able to get it anyway where you are).